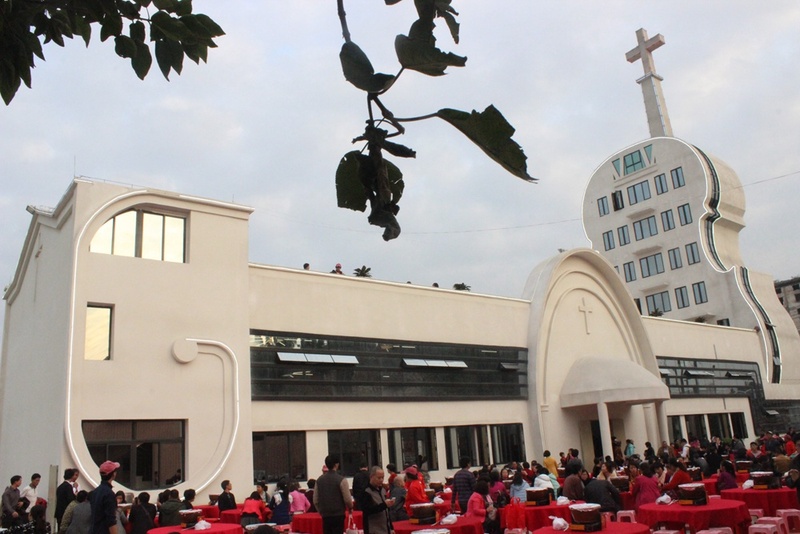 While we were reporting the news of a church built in form of a high heel in Taiwan to SelahAfrikans earlier in the year, another church was being dedicated in China. A church built in the shape of a violin has been dedicated in in Foshan, Guangdong Province. Yanbu Church, located in the East Huanzhen Road of Foshan,is called “Violin Church” because of its appearance. There is a cross at the top of the “Violin” which means high lifting the cross and “letting praise arise”. Violin is a musical instrument so the design of the church contains the meaning of praise. The chairman of Foshan CCC&TSPM, Rev. Yu Qing, shared three points about the appearance of the “violin” Church: Firstly violin is a difficult solo instrument through which we can see the playing skills are quite important. It’s like the construction of a church in which we need to learn constantly and practice repeatedly to acquire it. A Christian should also think whether s/he can be a solo instrument which can play the beautiful melody of faith when he or she commits himself or herself in a church. Secondly violin is an important pillar in modern symphony. What pillar will it be in Yanbu, Foshan and even Guangdong? Have you considered how to play yourself meanwhile you merge into the society? Thirdly there are 70 sections in a violin. For Christians, the number Seven is connected with the word ‘complete’. The cross is placed on the head of the violin, which tells that although the main structure of the building is a violin, it is the church of Foshan that should lift the spirit of Christ’s love, glorify God and edify people.